Smolych, Yurii [Smolyč, Jurij], b 7 July 1900 in Uman, Kyiv gubernia, d 16 August 1976 in Kyiv. (Photo: Yurii Smolych.) Writer and Soviet community activist. 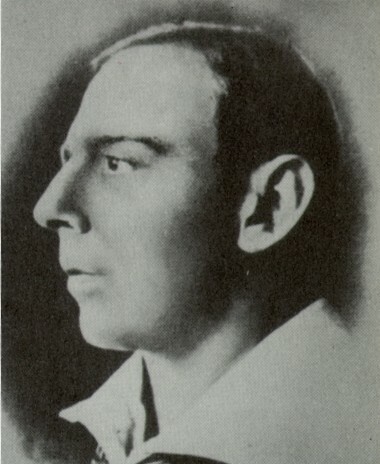 He was editor of the journals Sil’s’kyi teatr (1926–9) and Universal’nyi zhurnal (1928–9), a member of the literary organizations Hart and Vaplite, and one of the organizers of the Techno-Artistic Group A. 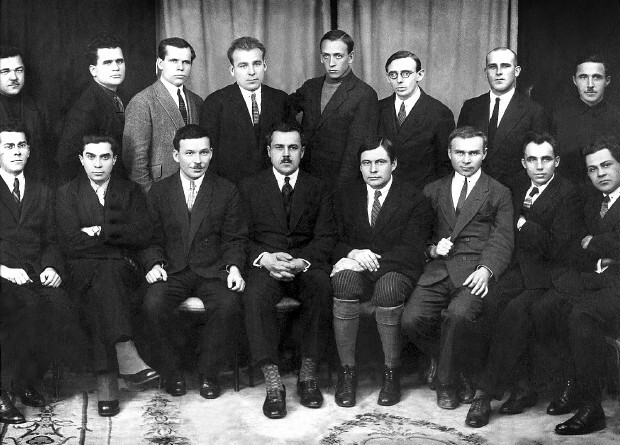 Upon the formation of the Writers' Union of Ukraine, he became editor of Literaturnyi zhurnal (1934) and headed the Kharkiv branch of the Writers' Union until the Second World War. After the war he lived in Kyiv and for some time was editor of the periodical Ukraïna. Smolych is known as one of the founders of Soviet Ukrainian prose. His first collection of short stories, Kinets’ mista za bazarom (The City End beyond the Bazaar, 1924), was followed by the collections Nedili i ponedilky (Sundays and Mondays, 1927) and Pivtory liudyny (One and a Half Persons, 1927). His prose from the 1920s is characterized by searching and experimentation with form, by originality and strong plots. Smolych pioneered the Soviet Ukrainian fantasy novel with Ostannii Eidzhevud (The Last of the Edgewoods, 1926), and continued to develop this genre in the trilogy Hospodarstvo doktora Hal’vanesku (The Property of Doctor Galvanescu, 1929), Shche odna prekrasna katastrofa (Another Beautiful Catastrophe, 1932), and Shcho bulo potim (What Happened Next, 1934). From the late 1920s, the satirical novel, which was mainly directed against the Ukrainian liberation struggle and the Ukrainian national-minded intelligentsia, began to be an important genre in Smolych's work (Fal’shyva Mel’pomena [The False Melpomene, 1928], Po toi bik sertsia [On the Other Side of the Heart, 1930]). His satirical novels were also directed against people of the capitalist world and their reactions upon coming into contact with the Soviet regime, portrayed according to the image of them projected in the Soviet press (Sorok visim hodyn [Forty-Eight Hours, 1933]). Among Smolych's better works from the second half of the 1930s is an autobiographical trilogy, set in the era of the childhood and youth of his generation: Nashi tainy (Our Secrets, 1936), Dytynstvo (Childhood, 1937), Visimnadtsiatylitni (The Eighteen-year-olds, 1938). During the Second World War, Smolych published several collections of short stories (Narod voiuie [The People are Fighting, 1941], Noveli [Novellas, 1942], and others). The novel Vony ne proishly (They Did Not Get Through, 1946) is also on the subject of war. In the 1950s, Smolych turned to the events of the Ukrainian-Soviet War, 1917–21, in Svitanok nad morem (Dawn by the Sea, 1956) and in the two-part novel Myr khatam, Viina palatam (Peace to [Peasant] Houses, War on Palaces, 1958) and Reve ta stohne Dnipr shyrokyi (The Broad Dnieper Roars and Groans, 1960). These latter works are publicistic novels or political pamphlets on the history of the Ukrainian National Republic and its activists, and their literary merit is overshadowed by the grotesque style of political propaganda. One of Smolych's greatest literary achievements is the memoir trilogy Rozpovid’ pro nespokii (A Tale of Unrest, 1968), Rozpovid’ pro nespokii tryvaie (The Tale of Unrest Continues, 1969), and Rozpovidi pro nespokii nemaie kintsia (The Tale of Unrest Has No End, 1970), in which he described literary life in Kharkiv in the 1920s and 1930s. Smolych also wrote publicistic political pamphlets directed against Ukrainian nationalism (Vorohy liudstva ta ïkh naimantsi [The Enemies of the Human Race and their Hirelings, 1953]), and popular literary criticism: Persha knyha (The First Book, 1951) and Rozmova z chytachem (Conversation with the Reader, 1953). His collected works have been published in six volumes twice (1958–9 and 1971–3), and in seven volumes (1984). In the role of community activist, Smolych participated in the activities of the Writers' Union of Ukraine, and for many years he headed the Ukraina Society. In 1970, Smolych was decorated with the highest award of the Union of Soviet Socialist Republics, Hero of the Soviet Union, mainly for his activities in the society, whose work was directed against Ukrainian émigré groups.